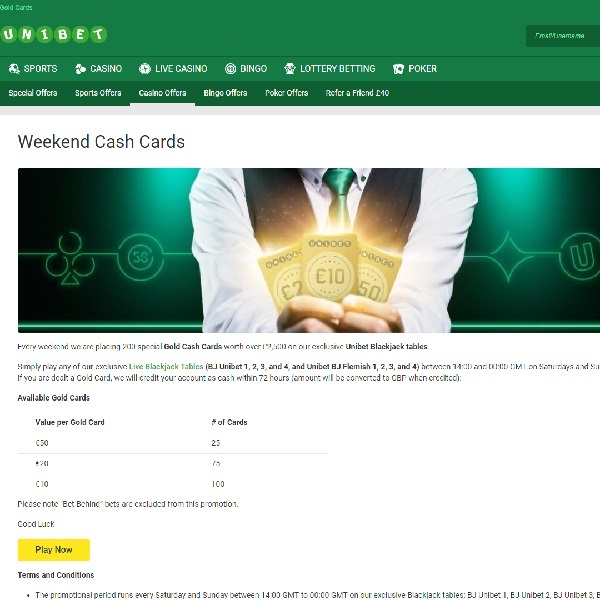 This weekend Unibet Casino has hidden 200 special Gold Cash Cards worth over £2,500 at its exclusive Unibet Blackjack Tables. All you have to do is play at the eligible tables between 2pm and midnight today and if you are dealt a gold card you will win a bonus. The eligible tables are Blackjack Unibet 1, 2, 3 and 4 and Unibet Blackjack Flemish 1, 2, 3 and 4. There are 25 cards worth €50 hidden in the packs, 75 cards worth €20 and 100 cards worth €10. This is a great chance to enjoy quality blackjack and a top casino and with a bit of luck come away with more than your winnings simply by receiving a gold card. Make sure you don’t miss out, visit Unibet Casino today at take a seat at the blackjack tables.